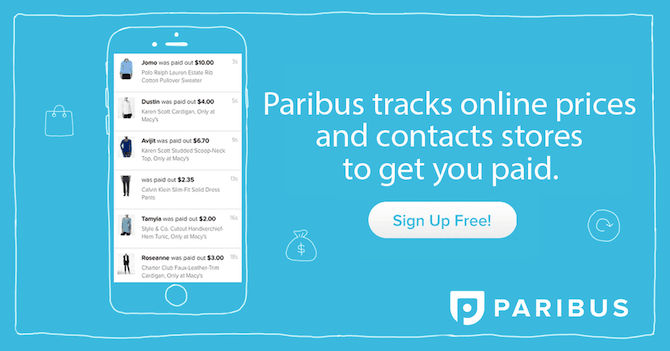 Home » Save Money • Reviews » Paribus Review: Get Money Back When Prices Drop! Paribus is a relatively new site where you can track your online purchases and they will send you a refund if there is a price drop on any items from those purchases. It’s a great time-saving application, filing price adjustment claims for various online sites on your behalf, so you don’t have to worry about anything! Because of these benefits, Paribus is very popular and has thousands of regular users, by helping them save millions of dollars on a wide variety of products. In this Paribus review, you can find out what exactly Paribus does, and how it can help you to save money. How Do I Get Paid with Paribus? Conclusion: Is Paribus Worth a Try? Paribus is a price checking and monitoring site that helps you save money on previously purchased products if the price drops after purchase. If a price-drop is detected, Paribus will send the company, which you purchased the item from, a price adjustment claim. This means that you can sit back and relax as Paribus does all the work for you, and gets you partial refunds on the products you love! The company began in 2014, but was purchased and is now owned by Capital One, who has taken and improved the application thoroughly for maximum customer benefit. You can have it as an app on your phone (iOS only), or as a browser extension on your computer. As well as saving you time and money on price guarantees, Paribus can also track your orders from both Walmart and Amazon, and if the delivery of the item is late, you can claim back a $10 credit. Paribus sends all of these refunds directly to your bank account (if you have linked your cards), with no limit to reach before these funds can be withdrawn. Further on this Paribus review, we will go through the process of getting paid with the application, as well as how to use it to your advantage. You Might Also Interested in: Can I Get Amazon Price Adjustment If Price Drops After Purchase? Paribus works by monitoring all of your online purchases and looks for cash back or refund policies that can be used to get your money back on your purchases. If any of your previous purchases qualify for a refund, then the application will work on getting you back the money you deserve. Paribus looks at every site’s price adjustment policies, taking into account if the price drops. If you are eligible, Paribus then will file a price adjustment claim on your behalf and will send the refund straight into your bank account if successful. To use Paribus, you have to link it to your emails, so that it can monitor all of your previous purchases and online receipts. You can also link it up to your cards so that the money can go straight into your accounts, but this is optional. Many people will feel uncomfortable with letting a company have access to your personal emails, but Paribus is very safe and is a secure money-saving method. It will only look at emails where online receipts are visible, and will not take advantage of any personal information. If you are not comfortable with Paribus having access to your personal emails, you can always set up an email that can be only used for both your online purchases and Paribus. Paribus can be used both as an application on your phone and as a browser extension on your computer. Most companies do not actively advertise their price adjustment policies, so Paribus collectively stores all of this information so you don’t have to go looking for it yourself. It is partnered with many online stores, so a partial refund is easy to get. However, refunds are not guaranteed, and some users have reported none to little earnings from using the application. Paribus is only a middleman between you and the companies you purchase from, so refunds can either be delayed from the liable company, or you are not getting refunds because no items are eligible for one. Access to Paribus is currently only available in the US and Puerto Rico. However, Paribus is currently trying to make the app available in other countries in the future. It partners with various online shops, such as Amazon and Target, to help you get money back on your purchases. It is available on all computers as a browser extension, however, it is only currently available on Apple devices as a mobile application. There are plans to develop it into an application for all Android devices too. Because it works directly with certain email providers in order to scan effectively for receipts, you can currently only sign up with Gmail, Microsoft and Yahoo email accounts. In this Paribus review, we have been through the basics of what Paribus is, how to use it, and how it works to save you money. Now, we are going to culminate all of this information into a pros and cons list in order for you to see if Paribus is the right price checking tool for you. Fast and efficient – Paribus processes any refunds straight into your bank account. It also goes through all of your past online receipts using the price adjustment information it has for various companies quickly and regularly in case of a possible refund. Saves you time – You don’t have to do anything on your side, Paribus does all the work for you. They will file all the price adjustment claims to the companies, so you can sit back and relax. Free to use – There is no sign-up fee to use Paribus on either phone or as a browser extension. Easy to use – All you need to do is enter your email, and you can start saving money. No need to enter your entire life history like other apps, they keep it simple. Helps you to save money – Save money on every online purchase you make, if there is a price drop after purchase. Secure – Paribus uses multi-level security mechanisms to keep your information safe. This includes using firewalls, VPN services, and more so that you are at ease over the safety of your personal data. Works well with every online retailer – Paribus can be used for most online stores, for any purchases you make with them. Availability – It’s not currently available on Android phone devices, and can only currently be used in two countries, the US and Puerto Rico. They are however developing the application so it can be more widely accessed. Email access – The application has access to your emails to send, receive and delete them. Many people are wary of this, but Paribus has no malicious intentions and won’t take or share any of your personal data. Technical issues – There are some technical issues that people who have used the app have experienced, including not accepting Amazon logins. But these are minimal and far between. Card access – It also can have access to your card details (if you want the refund money to go directly to your bank account), but this is optional. Again, Paribus has no record of ever stealing anyone’s details or identity through this. No refunds – Mainly people who regularly shop online have only seen refunds being paid out. If you are not a frequent online shopper you may not experience many refunds, if any. My overall opinion is that Paribus is a good application for saving money, and should be used in conjunction with good financial habits such as budgeting and eliminating any of your debt. It has many benefits including saving time so that you can spend that time doing the things you love. However, it is not a replacement for these good financial habits, and all activity on this site and any online purchases should be noted down for your own personal future reference. I also feel that if you do not do the majority of your shopping online, then you won’t see many refunds coming into your bank account. To get paid with Paribus, you need to have a credit card linked to your account, so that any refunds that you get with the application can go straight to that account. Paribus will never receive your card details, so you don’t have to worry about the security of your data. There is no limit that you have to achieve so that you can withdraw money from your Paribus account. All money can either go straight into your bank account when the refund is approved, or you can request a certain amount to be transferred. 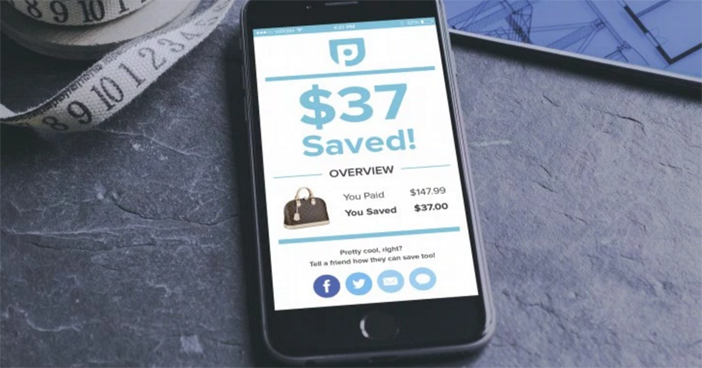 Over the past few years it has been active, Paribus has identified over $6.5 million worth in potential savings for its users. 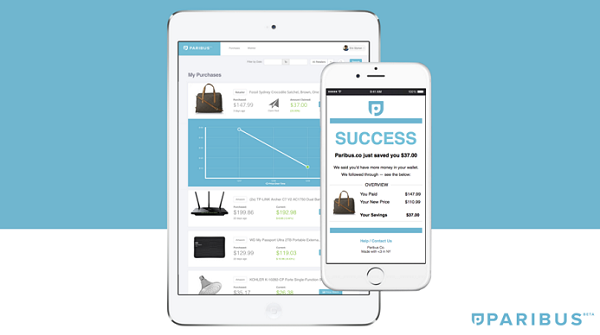 Paribus is a great application to use to get money back on the purchases you make online. The site is very efficient and diligent at looking for price drops on the purchases you make online. And once you sign up, you’ll be instantly getting any refunds that you may have already qualified for. Whilst refunds aren’t guaranteed, the application will try it’s best to use its backlog of all price adjustment guarantees of the sites it has partnered with, in order to get you money back on your purchases. In this Paribus review, we mentioned how it’s beneficial for saving time when shopping online, and how it has an easy to use interface and dashboard for all your past purchases. Plus, Paribus will keep all of your information safe and secure, so you don’t have to worry about your personal data being stolen. Many people worry about this and think that it may be a scam. But everything is safe and secure thanks to the security systems the company has in place. On the whole, using Paribus is a very beneficial way to save money whilst you shop online, without having to lift a finger. And for that reason, I definitely recommend using this while you shop.